Delta says it's back on track after a power outage led to three days of widespread delays and about 2,000 canceled flights. The company said at 12:30 pm ET that only 25 flights were aborted Thursday morning, and some of those cancellations were due to bad weather in the Midwest. Delta added that "no additional cancellations are anticipated." That's a marked improvement from Wednesday, when the airline had canceled more than 270 flights by 12:30 pm. The headaches started when a six-hour power outage crashed Delta's computer systems Monday morning, grounding its planes worldwide. 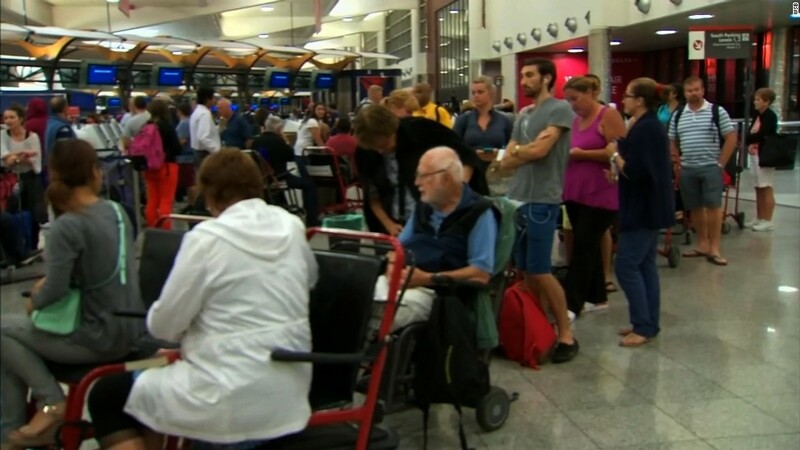 Customers were left stranded for hours, some even overnight. Social media was flooded with photos of people curled up with blankets on terminal floors. There were further technical issues even after the systems were brought back online, which slowed down the recovery process. It took a about two days to get all of the airline's systems operating normally, a spokesperson said. Then there were scheduling issues. "When Delta doesn't fly aircraft, not only do customers not get to their destination, but flight crews don't get to where they are scheduled to be," Delta COO Gil West said in a statement on Tuesday. That caused delays and cancellations to snowball. But now the airline "is back on its feet," Delta vice president Dave Holtz said Thursday. And the company said that more than 85% of flights were taking off within 15 minutes of their scheduled departure time. Through the end of the day Thursday, Delta will continue to offer refunds to customers whose flights are canceled or delayed more than 90 minutes. They can also opt to reschedule a trip for no later than August 21. Passengers that reschedule for later than August 21 may have to pay the difference in ticket price, but Delta will still waive its $200 rescheduling fee. Delta did give customers booked on flights that are canceled or delayed more than three hours an additional $200 voucher, but that offer expired Wednesday.